As I write this in Q2 2018, non-agency US federal debt is estimated at $21,120,516,214,632.52, or about $64,727 per person in the US. What fraction of that $21.1 trillion debt do you suppose is held by the Chinese? Go ahead, guess, I’ll wait. China held around [redacted] trillion of Treasuries as of the end of January, making it the largest of America’s foreign creditors and the No. 2 overall owner of U.S. government bonds after the Federal Reserve. Any move by China to chop its Treasury portfolio could inflict significant harm on U.S. finances and global investors, driving bond yields higher and making it more costly to finance the federal government. Ready to guess now? Answer below. I took the car into the shop on Wednesday. In the uncomfortable waiting room, an older guy who was waiting for his repair was going on and on and on about how awful all politicians are — they should all be shot — and especially how awful the administration's economic policies are. I argue that there's plenty of room to criticize the timidity of administration's economic policies — why bail out zombies instead of starting fresh, clean, government run banks and privatizing them eventually? — but that wasn't the substance of grandpa's attack. No, he was talking about the biggest government spending in history, that 'massive' stimulus bill. It was Hoover all over again. I couldn't get him to believe that government spending wasn't at an all-time historic high in percentage terms. But I literally couldn't get him to look at it. “I don't want to argue with a know-it-all,” was his reaction. In other words, “No Facts Please, We're George Bush's Americans.” And when I told him the table had been produced by the US Government, that just iced the cake, “Well, the government,” as if anything they said couldn't be believed. Some ignorance is impregnable. But I'm putting the chart here for easy reference the next time the car needs work. And for good measure, here's a link to a chart I found, The Audacious Epigone: Government spending as a percentage of GDP by country which suggests that the US is number 144 of the 160 countries surveyed for government expenditure as a percent of GDP. I'm a little suspicious of this number, since I think for true comparison one should include all state/provincial spending in federal systems, but there it is. Once in a while I intend to post either the answer to a question that comes up in conversation, or — if I can't find it anywhere — a plea for someone to tell me where to find an authoritative source. So when I say 'FAQ' I don't mean about this site. The first of this very occasional series has to do with tax rates. 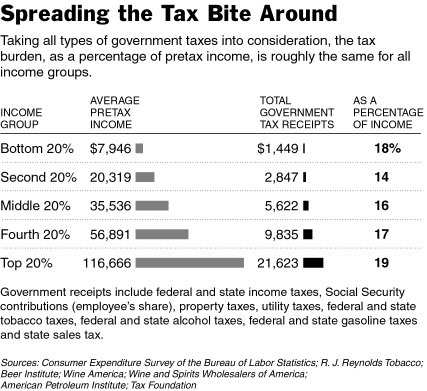 Total tax rates — federal plus state. Now, obviously this is very much an average since local taxes vary a lot. But it's still much more informative, I think, than just looking at the (seemingly more progressive) federal income tax alone. Throw in all taxes, and the picture looks quite different, practically flat. Click to see Average marginal total federal and state tax rates. And note that this data pre-dates the latest round of Bush tax cuts for rich folk.